The Guitar Pro Mobile application allow you to easily display your files by artists, favorites, albums, addition or opening history. Info scroll your list downward to access the search bar. Open one of your file to access to the main menus of your application. Transposition: the scores' tones can be adjusted half-tone by half-tone. > Info: this will affect only the guitar and bass tracks. Switching the current track: press the track you wish to see on your screen. Type of notation: to show standard or tablature notation, separately or together. Or choose to show the Slash notation. Score size: adjust the size of your score for your needs and comfort. 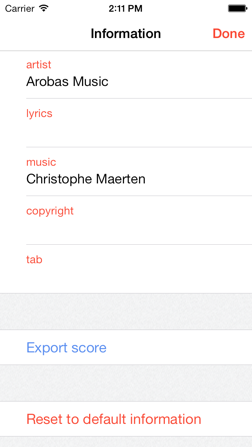 Info the score's size adapts to the orientation of the iPhone or to the score's contents. 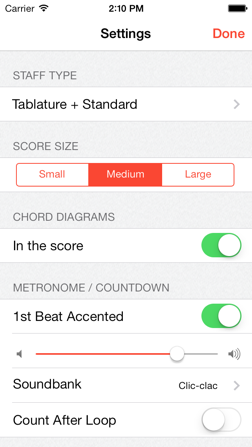 Managing metronome and countdown: to practice in time, you can choose activate or deactivate the metronome and/or the countdown. 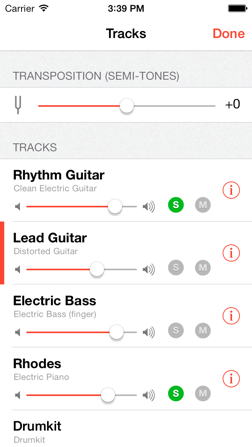 You can also adjust the volume, and change the soundbank selected for the metronome. 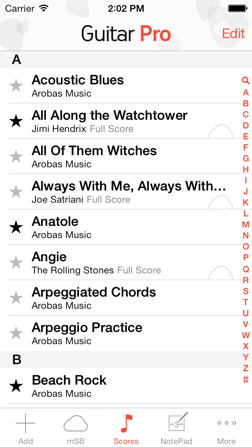 The application gives you the possibility to display or hide the guitar fretboard or the keyboard below the score. Info left-handers have not been forgotten! Info the keyboard or fretboard will be displayed depending on what instrument has been selected for the active track. By default, playback will stop at the end of the tune. You can activate the loop option for continuing playback. You can consult and edit the information concerning the score. Info The "Reset to default information" feature allows you to get back to the score's information at the date at which it was added to your iPhone. Info the export will not take into account the changes made to the tablature's information. 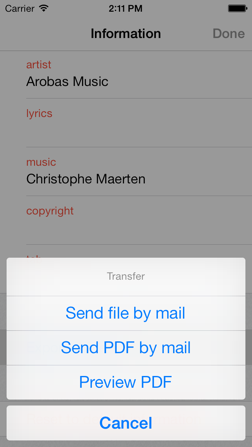 Info pre-visualizing the PDF file will also allow you to print directly from your iPhone (provided you have an AirPrint-compatible printer).